A Skirt That Goes With Everything -well, that was the dream. Time will reveal the reality! 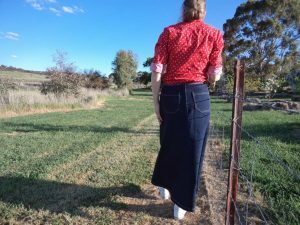 I’ve been turning this idea over in my head for a while now, examining capsule wardrobes in Pinterest, considering the perfect fabric, reading blog posts on colour analysis in one’s wardrobe, etc etc. I’m aware of the problems of trying to make a garment too versatile. It can end up looking too boring (because it’s too functional), or being not quite right for anything because it’s trying to be everything. 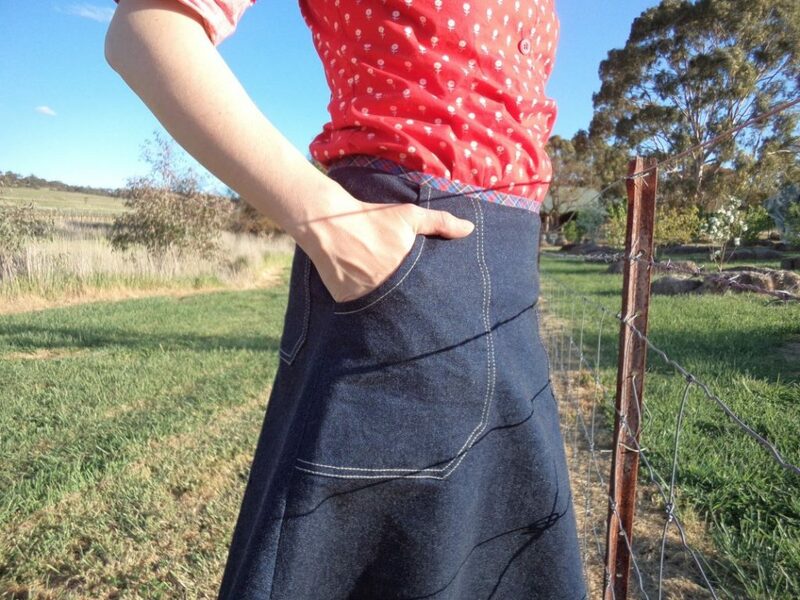 However, you can’t go too wrong with denim; any tops that go with jeans should theoretically go with this skirt. 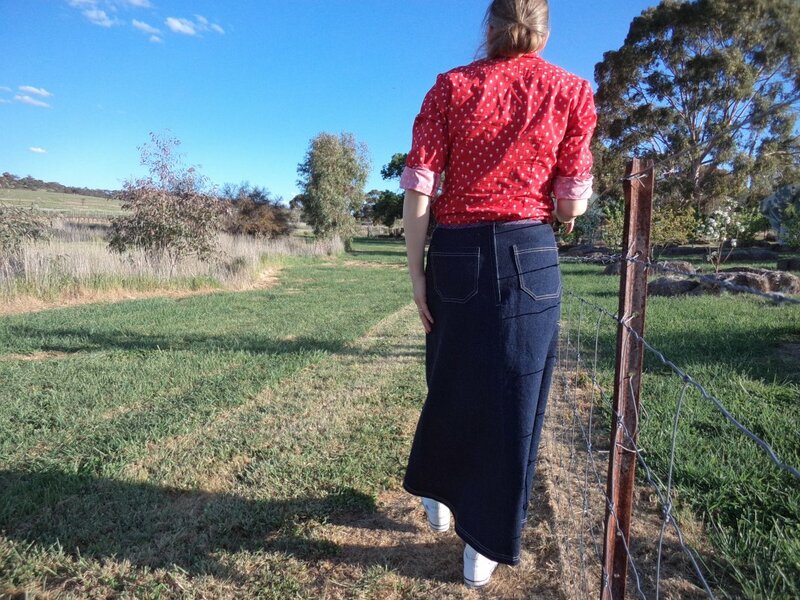 It’s an unlined A-line skirt, with patch pockets back and front (for which I thoroughly enjoyed doing the topstitching). 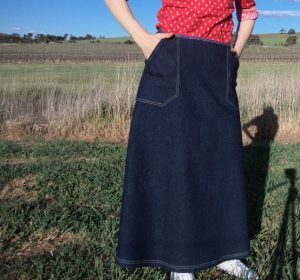 I had no spare fabric to finish the waist so I bound it with some bias binding, but with such thick denim this is probably the elegant solution. It’s waaay too long; no fear of any Marilyn Monroe/Seven Year Itch moments occuring! 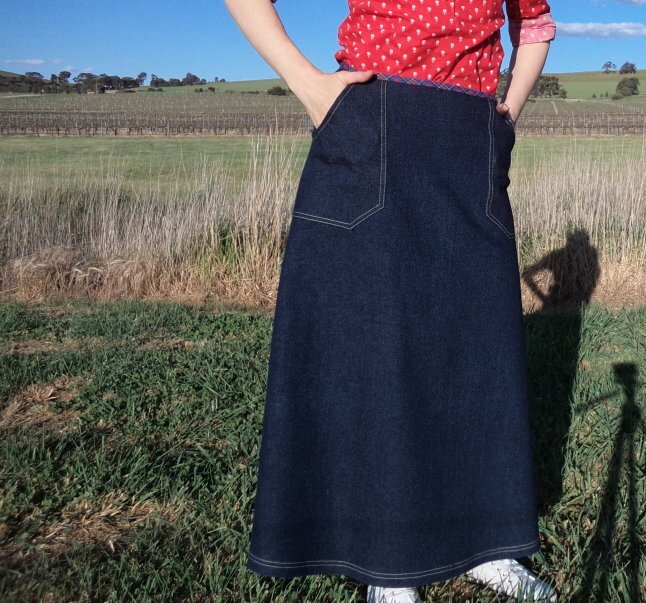 It would look better 10+cm shorter or knee length if I want to wear it in summer. Might wear it a few times then make it shorter. I think it looks lovely. Most of the things I make I can only wear in the backyard. I made this tube looking shirt with elastic at the top. Now I wear it as a blouse cover up when I get out of the shower. My husband says he is waiting to catch it in the bathroom by it’s self because he will be using it to wash the car! I have learned over my many years that sewing gives me relaxation, to be stress free. It sure is stress free when I know I don’t have to be seen in it! Hi Cindy, thanks for the fun story. I agree, sewing is relaxing when we don’t put pressure on ourselves!